Born--July 14, 1917. Ada, Oklahoma. "Good evening, everyone, from coast to coast," was Douglas Edwards' customary greeting to CBS News' television audience for over a decade. Edwards was the first anchorman of the first regularly scheduled daily television new report. 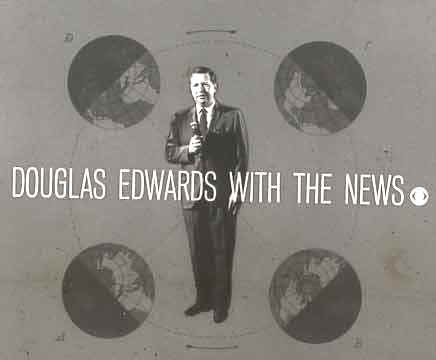 In Sept. 1951 it was broadcast across the country for the first time, and "Douglas Edwards with the News" was seen live from Maine to California. The child of Tony and Alice Donaldson Edwards, Clyde Douglas Edwards spent part of his early childhood in Silver City, N. M. listening to a crystal radio set "transfixed by broadcasts I could bring in from faraway places." (Edwards, 19) His family moved to Troy, Alabama where he began his broadcasting career in radio at age 15. Edwards started as the junior announcer on a 100-watt radio station that a group of older friends put together "with rubber bands, high hopes, and great spirits." (19) His first assignment was to announce the selections played by the organist in the Methodist Church next door to the fire hall where the station (WHET) was located. He worked for several years doing the standard small town radio station duties of reading news, playing records and announcing upcoming programs. Edwards entered the University of Alabama in 1934, initially intending to study medicine. 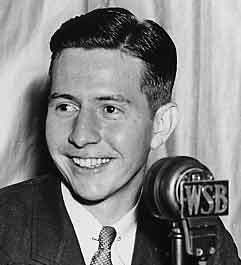 He continued his studies at Emory University and the University of Georgia Evening College, where his ongoing fascination with broadcasting led him to study journalism. During his college years he continued working in radio as an announcer and new reporter for stations in Dothan, AL (WAGF) and Atlanta (WSB). Edwards spent a short stint at WXYZ in Detroit as a "Cunningham Ace", after the sponsor, Cunningham's Drugstore, and as an announcer for programs like The Lone Ranger and The Green Hornet, sharing these duties with other announcers including Mike Wallace. He returned to WSB as assistant news director where he continued to gain experience in news writing. 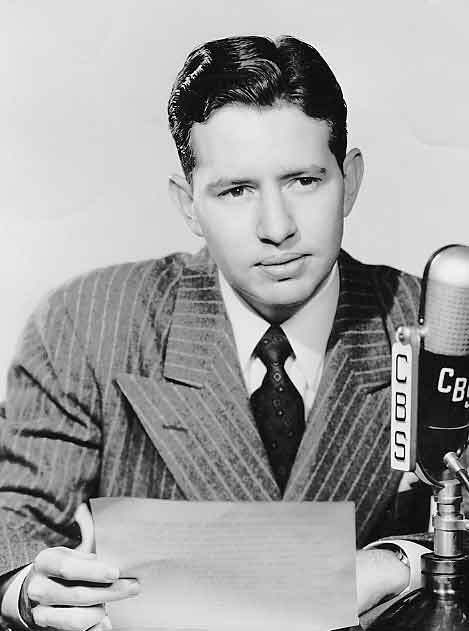 In 1942 he began his long association with CBS, starting as an announcer, but soon finding himself reporting the news and filling in as the news reader on the daily broadcast. Edwards took over the main broadcasting duties in 1943 when John Daly, the regular announcer, was assigned to North Africa. "Made in front of Westminster Abbey on April 5, 1945, (approx.) Anniversary of invasion of Norway. King Haakon regrets that he could not appear with us in the picture, but that's royalty for you!" 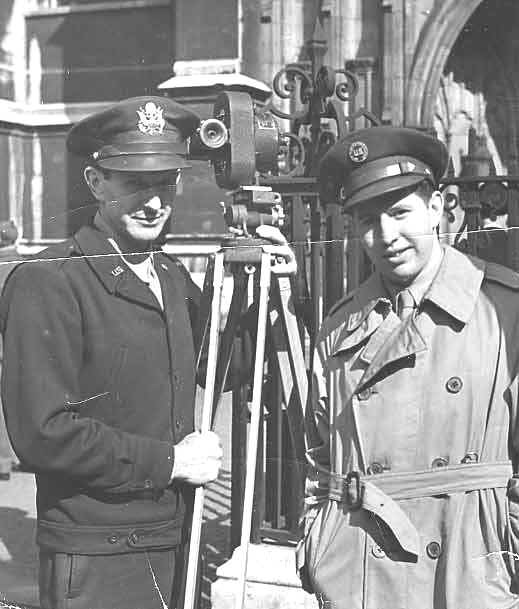 After frustrating efforts to be assigned as a war correspondent himself, Edwards finally spent time overseas, serving under Edward R. Murrow, during the final days of World War II. He stayed on as a correspondent in Paris helping to prepare for CBS's coverage of the Nuremberg trials. Edwards returned to the States in June 1946 and was chosen to anchor the "CBS World News Roundup". He soon became the first major radio news reporter to take up television duties, reporting twice a week. It wasn't an easy decision for him to make, in fact his initial reaction was to say no to the offer. Television was considered unworthy for serious journalists, a sideshow and dead end, by many in broadcasting and print. Not only that, but Edwards would have to give up the substantial additional income which radio advertising provided to announcers. It took Frank Stanton, the president of CBS, to convince him that, far from being a dead end, television was the wave of the future, and Edwards accepted the job. Many years later, Dan Rather would say, “Doug was the inventor of television news anchoring." Edwards and his small staff wrote and edited each broadcast and were, indeed, pioneers in developing the format for television new reporting. While Edwards and his crew found solutions to many unique situations in this new world of television, one particularly difficult problem was fundamental in video broadcasting. In order to read the news, Edwards, along with all other news broadcasters, would look down at his text, then back at the camera. This was distracting to the viewer and disrupted the flow of the reporting. Cue cards were introduced, but had the disadvantage of being to the side of the camera, so that eye contact was still not maintained with the audience. Don Hewitt, the director/producer of the program, and future producer of "60 Minutes", suggested memorization, which wasn't a real possibility for so much material on a daily basis, and even asked if Edwards would learn braille. In the end, a CBS technician created an early version of the teleprompter which scrolled the text over the camera and, finally, solved the problem of the newscaster and the viewer looking at each other. The "CBS Television News" began as a Saturday night broadcast, expanding to two nights in 1947 and becoming "Douglas Edwards and the News" on a nightly basis on August 15, 1948. Another major leap forward in television news reporting came in 1948 when Edwards led the broadcast team at the Republican, Democratic, and Progressive national party conventions in Philadelphia. At this time the broadcast was seen by 30,000 views in just five eastern cities. By the mid-1950's it would be viewed by over 30 million. Rival NBC began its television news efforts in 1949 with John Cameron Swayze as the newscaster. From this point forward the competition between the networks for viewers was intense. With the flashy Swayze as anchor and his "hopscotching for headlines" approach to the news, NBC quickly jumped into the ratings lead. Viewers' tastes matured as the 1950's progressed and Edwards more business-like approach put his program back in front by 1955. Ratings would have significant behind the scenes effects on television news, and Edwards' career. This period was Edwards' heyday. His ubiquitous presence at CBS was remarkable--Anchorman of "Douglas Edwards and the News" (1950-1962), the main evening news broadcast; host of the "Armstrong Circle Theatre" (1957-1961); host of "Masquerade Party" (1952-1960); "anchorman" for the Miss America Pageant (1957-1961); host of "Answer Please" on the radio (1958-? ); host of "FYI" (1960). One of his more unusual posts was on the radio soap opera "Wendy Warren and the News" (1947-1958). Edwards appeared as himself in each episode to read the news and chat with Wendy Warren, as played by Florence Freeman. * He covered the attempted assassination of President Truman, Queen Elizabeth II's coronation, the attack on the House of Representatives by Puerto Rican nationalists, and presented an eye-witness account of the sinking of the Andrea Doria. 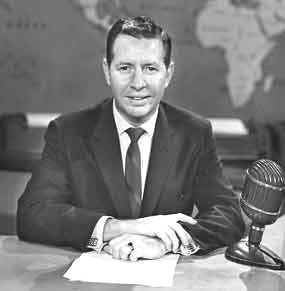 Edwards was recognized for his work by Emmy nominations for Best News Commentator or Reporter in 1956 and for Best News Commentator in 1958 and 1961. He won the George Foster Peabody Award for distinguished achievement in television journalism for his coverage of the Andrea Doria sinking, and the Hamilton Times Award for his "objective and dramatic presentation of the news of the world" in 1956. He was recognized as one of the "Immutable Images of Oklahoma in 1960 and received the Big Red Apple award from San Jose State for meritorious service in American journalism in 1961. Even while Edwards was riding his wave of success, the ratings underpinning his ride were beginning to weaken and internal jockeying for the anchor's chair began at CBS. Walter Cronkite had taken over the anchor duties at the 1952 political conventions and become the regular, and very popular, CBS reporter for major events over the next decade. There was an ongoing campaign by some at the network to put him into the anchor's seat, but Edwards continuing success precluded that move through the late 1950's. Meanwhile, Chet Huntley and David Brinkley had taken over the NBC evening news broadcasting duties, and their attractive teaming put NBC back into the ratings lead as the 1960's arrived. Without mentioning those ratings, the administration decided that it was time for a change at CBS and, on April 16, 1962, Cronkite took over the anchor duties from Edwards. And, perhaps, that's as good an epitaph as any for Douglas Edwards' career in broadcasting. 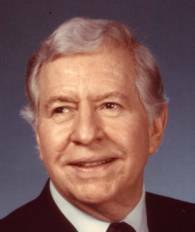 He stayed on at CBS, working on both television and radio for another 26 years before retiring in 1988, though his career as a major player ended that day in April 1962. On his retirement, his old colleague from the early days in Detroit, Mike Wallace, said, "He has not been flashy, and he has not been sensational--he's been solid." After a long fight with cancer, Douglas Edwards died Oct. 13, 1990. Postscript: Douglas Edwards was inducted into the Radio Hall of Fame in 2006.